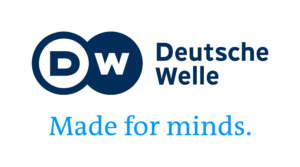 Deutsche Welle (DW) is Germany’s international broadcaster. DW has developed regional television lineups in English, German, Spanish and Arabic. With radio and online content available in 30 different languages, we are reaching more than 157 million people weekly worldwide. Our program offers news, features and documentaries covering everything from business, science and politics to arts, culture and sports. We reach out especially to international decision makers and opinion leaders. In authoritarian states, this applies to those who actively stand up for democracy, human rights and civil society. We also ensure that those who want to learn German will have access to content that will help them do so. DW conveys Germany as a nation rooted in European culture and as a liberal, democratic state based on the rule of law. Around 1,500 employees and nearly as many freelancers from 60 countries are working with DW around the world. DW Akademie offers media professionals a broad range of services, including cross-media traineeships, a bilingual master’s degree, as well as media training for executives of organizations and companies working internationally.